Video clip synopsis – Professor Huong, a cellist, was a member of the Hanoi Symphony Orchestra in the 1960s during the Vietnam War. He survived the war by hiding in an underground refuge in rural village near Hanoi. Broadband MP4 huong_bb.mp4 (11.4MB), suitable for iPods and computer downloads. The narrator briefly explains the background to the 1960s wartime location of the ‘Underground Hanoi Symphony Orchestra’ in Xuan Phu, a rural village near Hanoi. Professor Huong, who was a cello teacher in the orchestra, is introduced, and we see him preparing for a reunion concert in Xuan Phu, 40 years after the war. The camera follows Professor Huong through the vibrant streets of contemporary Hanoi and into his beautiful French colonial home. We hear him play the cello as he tells his story. This digital resource is from the project Screen Asia, a joint production of the Asia Education Foundation, Australian Children’s Television Foundation and Screen Australia Digital Learning. Click here for more digital resources for Asia. 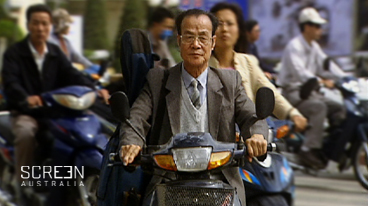 Meet Professor Huong of Hanoi is an excerpt from the documentary Vietnam Symphony, produced in 2005. Vietnam Symphony is a Film Australia National Interest Program in association with Stonebridge Productions. Developed with the assistance of the Australian Film Commission. Produced in association with the NSW Film and Television Office and SBS Independent. In the middle years of schooling, students can synthesise, analyse, reflect on and apply their learning to personal experiences of Asia in an increasingly independent way. They engage in cultural exchange, reflecting their enhanced understanding of their own culture, and their richer and broader framework of knowledge and understanding of Asian cultures. The aim is that students will increasingly empathise with people from different cultural backgrounds, and develop intercultural values and skills to participate in, learn from, contribute to and engage confidently in diverse cultural environments at home and abroad. In 1965, as the Vietnam War intensified and Hanoi faced the threat of massive US bombing, students and teachers from the National Conservatory of Music were forced to flee the city for the relative safety of a small village in the countryside. With the help of villagers, they built an entire campus underground, creating a maze of hidden tunnels, connecting an auditorium and classrooms. Here, the war raged around them, they lived, studied and played music for five years. The documentary interviews members of the orchestra in contemporary Hanoi, and follows their preparation for a return to the village and a reunion concert. It presents stories of danger and resilience, as well as the story of a changed Vietnam. These talented musicians and composers are now among the country’s cultural leaders, but they are finding it difficult to accept the next generation’s attitude to their ‘cultural treasure’ of classical musicianship. Vietnam Symphony is written and directed by Tom Zubrycki. For further background preparation, students should create a ‘Fact File’ rubric of three columns. (You will find a model on page 50 in In our Own Backyard: Connecting to Global Issues in Our Region, edited by Bronwyn Collie, published by Curriculum Corporation, 2006.) Label your three columns ‘Feature of Comparison’, ‘Vietnam’ and ‘Australia’. To complete the boxes, research information for the following ‘features of comparison’ for both countries: Geographic area, Population, Government, Capital population, Dominant language, Other main languages, Main ethnic groups, Religions, Average income per day/year, Average life expectancy, National literacy rate, Major exports including any to Vietnam/Australia, Major imports including any from Vietnam/Australia, Cultural exchanges with Australia/Vietnam. What are the main points presented in Professor Huong’s personal recount of his life? What do you observe about Professor Huong’s current lifestyle and what do we see that he values? Describe the atmosphere of his home. How does the soundtrack reinforce the atmosphere? What aspects of his daily life seem to echo his love of cello music? What are your impressions of Hanoi? What can you tell about the contemporary city of Hanoi? How does the director communicate this to the viewer? Compare the Hanoi city environment to the Xuan Phu village environment. We briefly meet Professor Huong’s son, Tuan. What do you learn about him from the images and the narration? Does the professor’s caged birds remind you of his time with the underground orchestra? How and why? What is a string orchestra? What is a symphony? The film’s title Vietnam Symphony has both a literal and a metaphorical meaning. Use the dictionary definition of ‘symphony’ to help you explain the two meanings. What is meant by an ‘underground orchestra’? If a war was to take place in Australia, which of the following artistic institutions would you choose to evacuate from bombing targets and relocate ‘underground’? You will need to do some website research to make an informed decision. Draw up a list of arguments to justify your choice and present this orally to your class. Use cue cards. Research a conflict which has resulted in a country losing a significant part of their culture eg Cambodian apsara dance, Afghanistan’s gigantic Buddhist sculptures, Tibet’s Buddhist monasteries, Aboriginal languages and song lines. Present your findings on a poster for class display. Include information about strategies undertaken to retrieve the loss. Vietnam Symphony Teachers Notes, Film Australia. Costain, M, 2005, Buddhism, Taoism and Shintoism, P20–23, in The Really Big Beliefs Project, Curriculum Corporation, Melbourne. Hoepper, B, 2008, Vietnam Topic Book, SOSE Alive, Jacaranda. Kwok, J and McKnight L, 2002, Film Asia, Curriculum Corporation, Melbourne. Ledger, S, and Ledger, R, 1998, Snapshots of Asia: Vietnam, Curriculum Corporation Australia, Melbourne. Lewis, R, 1997, Vietnam – Young People, Old Country. Secondary, Curriculum Corporation, Melbourne. Wheeler, 2007, Lonely Planet, Vietnam Guide, Lonely Planet. 5th edition.